We all do it, pondering ideas that never get executed, I’m happy I followed through on this one. Oh Pinterest, you make us all look and feel crafty, while most of the time those craft ideas never leave our Pinterest boards. I’ve been pushing myself lately to just try, to my surprise many things have worked out well. Of course there have been failed projects over the years, but no one has to see the failed attempts. Failure in crafts can also be quite entertaining and may be displayed to everyone for a good laugh. 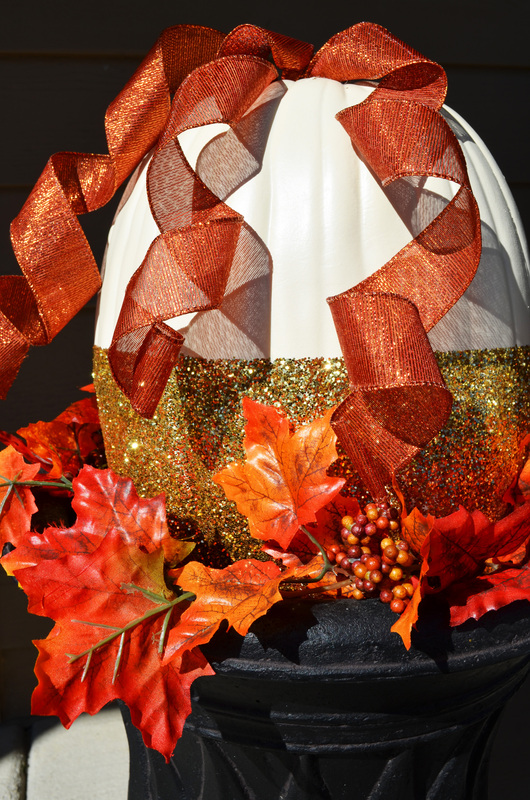 Envisioning this fall pumpkin craft I had high hopes and to my excitement it is stunningly gorgeous. This is defiantly going up onto Pinterest! I challenge everyone to push themselves and try something on your Pinterest board or a personal creation of your own. You may end up loving your new craft or recipe as much as I’m obsessing over these Fabulous Pumpkins. 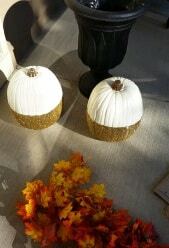 Here are the pumpkins all glittered up and ready for their finishing touches. You can also stop right here since these half white half gold pumpkins look so chic. 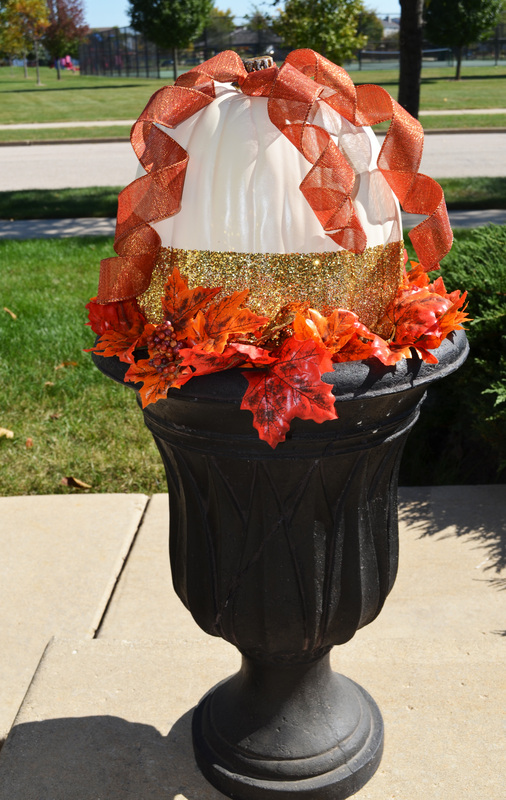 I took my entry way planters that are usually for flowers and made them into a beautiful Fall display. I can’t remember liking a fall craft more than these stunning Fall Pumpkin Planters. Using artificial pumpkins helps, you can reuse the pumpkins year after year. I Purchased the pumpkins from Micheal’s, a local craft store. Of course you could use regular pumpkins and paint them white first, then allow to dry completely before adding your glittered bottoms. Just look at those amazing Fall colors, these Fall Pumpkin Planters are beautiful, gorgeous, stunning and a perfect craft to enjoy year after year.